The excitement at Sisense continues with another big win! 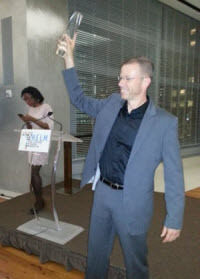 This time we won a quarter million dollar prize and top honor at the “Take the H.E.L.M.” competition held by the NYC Economic Development Corporation (NYCEDC) to encourage the most promising and innovative companies to make Lower Manhattan their home. More than 300 companies from the U.S. and around the world applied for the H.E.L.M. award. The judges were looking for companies that could contribute most to the economic development of Lower Manhattan. The selection committee included venture capitalists, former SEC chair Arthur Levitt, bankers and the President of the New York City Economic Development Corporation. In the years following 9/11 and Hurricane Sandy, New York has been going through an active revitalization process to rebuild not only Manhattan but specifically lower Manhattan which was particularly hard hit by both tragedies. We decided to open our new office on Wall Street, a very data driven business area with the world’s top stock exchanges just down the block. Our plan is to hire dozens of sales, marketing and support personnel that will help invigorate the area. We are happy to see that the trend is already developing with the O’Rielly Strata Conference and Hadoop World in Manhattan and a new Big Data event and group called Data Gotham. The H.E.L.M. event itself was really exciting starting with a tour of the World Trade Center area and a celebratory happy hour. Then each finalist gave a short presentation in front of the judges and presented a short video clip with company highlights and goals. The culmination of the event was a very festive award ceremony where Sisense was named top winner. This is our CEO, Amit Bendov accepting the award. We couldn’t be more thrilled. Take a look at the video clip we prepared for the award ceremony – we definitely had fun creating it!